The Inclusionary Housing Ordinance Subcommittee discusses the ordinance. Committee members proposed changes to the ordinance at their meeting Wednesday. 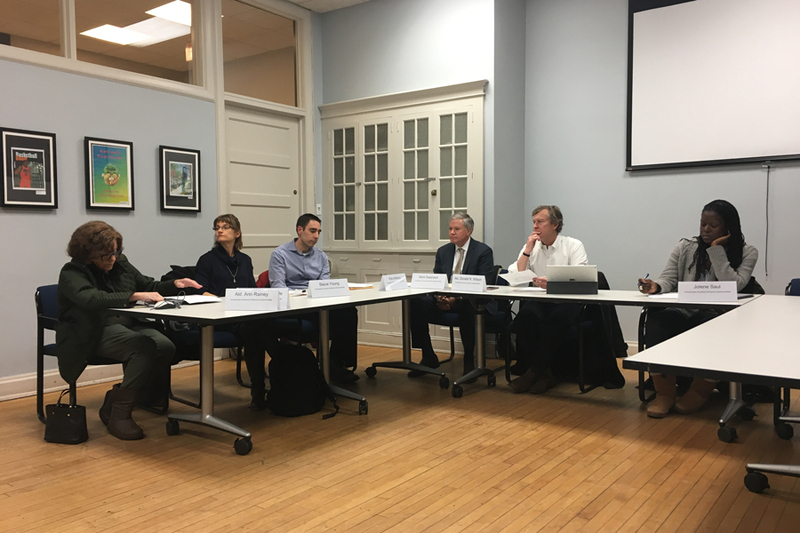 The Inclusionary Housing Ordinance Subcommittee proposed changes to affordable housing in Evanston, including the possibility of an additional real estate transfer tax, at their second meeting on Wednesday. Committee members, including aldermen, nonprofit workers and developers, evaluated goals for the Inclusionary Housing Ordinance at the meeting. Implemented in January 2016, the ordinance requires developers to make 10 percent of units affordable, pay a fee-in-lieu, suggest an alternative equivalent proposal or petition for a reduction of requirements. Ald. Donald Wilson (4th) said since passing the ordinance, officials have realized the fee-in-lieu might be too low to be effective. Wilson said demand for affordable units is high while, supply is low. The choice the city faces, he said, is between building more units and collecting money for an affordable housing fund. Ald. Ann Rainey (8th) suggested a referendum for an additional transfer tax separate from the existing real estate transfer tax. However, Wilson said he doubted it would pass. Rainey told The Daily it is “too bad” members of the community have turned against development in Evanston. She said she felt most of the “progressive community” supported projects such as the 33-story residential development on 601 Davis St., which City Council denied at a meeting last month. Rainey said the Inclusionary Housing Ordinance was a small but important part of a larger discussion about affordable housing. Housing and grants division manager Sarah Flax told The Daily it was “important step” that the committee looked for sources to fund affordable housing needs other than the ordinance. She added that alternatives such as a real estate transfer tax could help meet Evanston’s housing needs. During the meeting, Wilson said the subcommittee would attend a workshop about inclusionary housing to understand the vocabulary. For example, he said one of the terminology issues the committee faced was a recent misunderstanding about the meaning of “internal rate of return.” Flax clarified this does not refer to profit, rather the percentage of each dollar earned for a period of time. The subcommittee will hold their workshop, meet again March 7 and present to the council April 30.